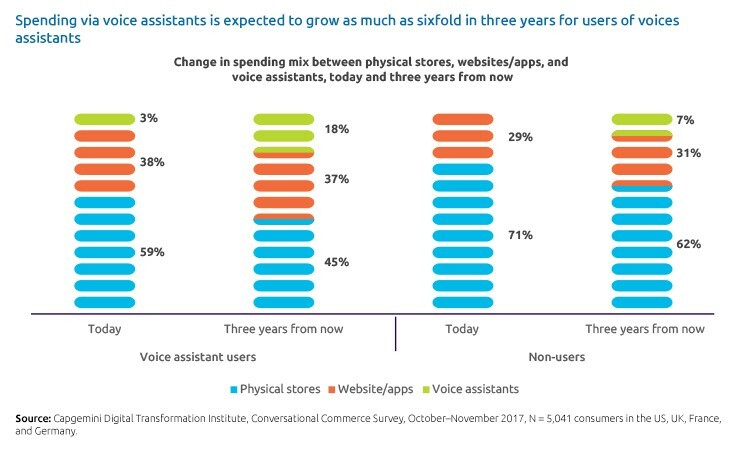 The opportunity to engage with consumers via voice assistants will only grow as the number of users mounts and voice assistants become more sophisticated. Consumers have found their voice when it comes to Conversational Commerce—the purchase of products and services via voice assistants such as Siri, Google Assistant, and Amazon Alexa. 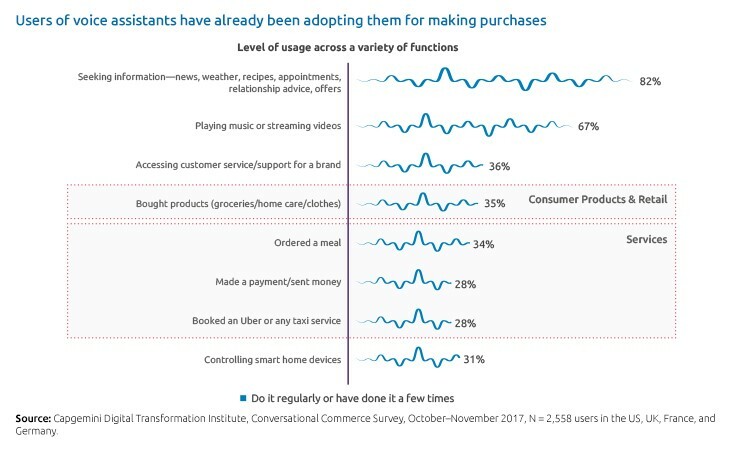 Our latest research of over 5,000 consumers in North America and Europe finds that more than half already use voice assistants in one form or another and over a third have already bought clothes, ordered groceries, or ordered a meal (see Figure 1) via a voice assistant. When we asked consumers how much of their total spend takes place via voice assistant compared to other channels, it’s only 3% today. However, this is set to increase threefold—to 18% of total expenditure in three years’ time (see Figure 2). This is a massive opportunity for retailers and brands looking for new ways to grow their business. We found that when consumers have a good experience with voice assistants, 45% of them increase their spend with the brand—at least a few times or regularly. In addition, they are willing to increase their spend with the merchant by 8% on average. Who are the voice spenders? Nearly a half of them are millennials. 47% of those spending money via voice assistants are between 22 and 32 years old. With millennials being both the largest demographic group in the workforce and one of the largest spending groups, it is imperative that organizations make the voice experience engaging and fulfilling for them. They are tech-savvy, urban dwellers. Two out of every three voice spenders are tech-savvy and live in urban areas. Their friends and family frequently reach out to them for assistance and advice on technology-related matters. Spending is currently focused on meals and consumer products. Nearly six out of ten voice spenders have spent money on ordering meals or buying clothes or groceries. The opportunity to engage with consumers via voice assistants will only grow as the number of users mounts and voice assistants become more sophisticated, pushing up satisfaction ratings and increasing personalization. All those involved in eCommerce need to start a dialogue with their consumers about Conversational Commerce. You can find fuel for that conversation in our research report.